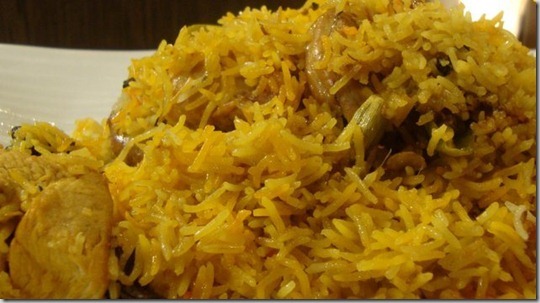 Here is the famous recipe of yakhni biryani by chef Zakir. This recipe is like yakhni pulao but with more spices and aroma of biryani. Soak 300 grams washed rice for half an hour. In a pan, heat 1 cup clarified butter. Add 2 tbsp. ginger garlic paste, 2 sliced onions and ½ kg chicken and sauté until color begins to change. Make a pouch of 250 grams yogurt, 1 tbsp. fennel seeds and 1 tbsp. coriander seeds with a piece of cotton and add to chicken. Then add 25 grams whole hot spices, salt to taste, 2 tbsp. turmeric powder and 6 to 8 green chilies and mix. Add 1 glass of water after some time. In an another pan, boil rice with salt to taste, 1 tbsp. cumin seeds and 4 to 5 aniseeds. Make a layer of rice on the top of chicken gravy. Top with melted clarified butter, kewra, and yellow color and allow simmering for 10 to 12 minutes. 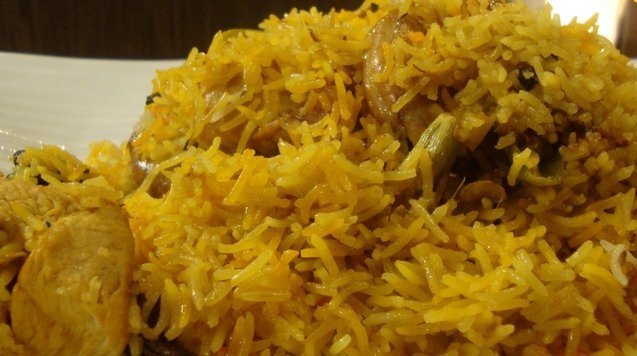 Delicious Yakhni Biryani is ready to serve. Serve with salad and yogurt dip.